ROCHESTER, N.Y. — Bishop Kearney came back from a halftime deficit to defeat Edison in a non-league matchup Wednesday, 73-68, at Edison High School. The Kings got off to a fast start behind two 3-pointers from Jamal Williams and three early buckets from Kidtrell Blocker. But the Inventors closed the first half on a 15-5 run, sparked by Alton Knight and Javonte McKnight, to take a six-point lead into the break. Out of the half, though, it was Blocker who took the game over. He nailed a 3 for the Kings’ first points of the second half. Then, Blocker drained a deeper 3. A few possessions later, Blocker stepped back at the top of the key and knocked down a third-straight 3, and the Kings had gone from down six to up six in less than four minutes. Edison responded, though, and pulled back on another end-of-quarter run to head to the fourth tied at 51. BK’s freshman guard, Miles Rose, was the one who got the Kings off to a fast fourth-quarter start. He crossed over, right to left, and drove down the left baseline before flinging up a floater for two. Then, he knocked down a 3 for BK’s next bucket. Again, Edison had the answer. When Alton Knight leaked out on a fastbreak and beat a trailing Blocker to the glass, the Inventors went up five. Rose answered with a finish through contact at the other end, although he missed the free throw. Under a minute, it was the game’s star, Blocker, who drove right into the lane and threw up a floater to put BK up by a point, 69-68. 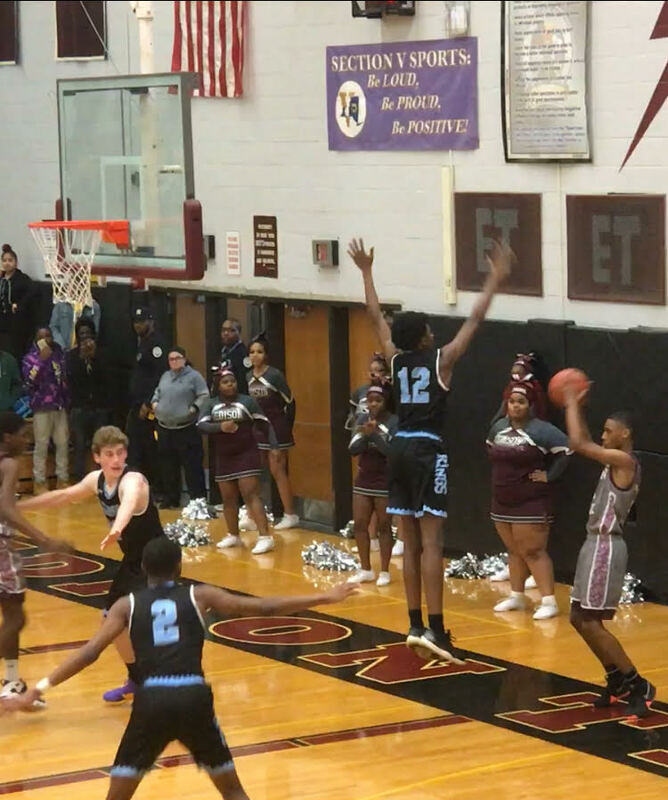 Antwan Williams defended BK’s rim on the defensive end with a big block, and then Blocker intercepted an inbounds pass before settling it down and being fouled. He knocked down both free throws to finish with 23. Two more free throws from Miles Monchecourt, who finished with 11, sealed the deal for the Kings. Also in double figures for Bishop Kearney were Rose with 12 and Jamaal Williams with 11. Knight led Edison with 18, followed by McKnight with 11 and Kevis Heard with 10. Bishop Kearney is back in action on Saturday against Global Concepts, at BK. Edison hosts UPrep on Tuesday, Dec. 18. Other scorers: Edison – Edgar Bass (6), Torrean Lewis (8), Natrell Colbert (2), Jawaun Holt (8), Kevin Jackson (3) and Nahjhime Kirton (6). Kearney – Jordan Searles (3), Mike Gentile (3) and Delontray Dixon (6).